Why Did We Just Have a Spring-Like Tornado Outbreak? The remains of a house in Waverly, Virginia, where three people—two men and a child—were killed when a tornado tore through the structure earlier this week. The United States is always smack in the middle of some of the most dynamic weather in the world, and conditions this week are living up to that truth. A sprawling storm that covered almost the entire eastern half of the country produced just about every type of weather imaginable this week, including blizzard conditions near Chicago and deadly tornadoes in the southeast. A snowstorm in the winter is hardly noteworthy, but why are we seeing a spring-like tornado outbreak in February? By Wednesday evening, the Storm Prediction Center had received 65 reports of tornadoes across eight states from Texas to Virginia, along with hundreds of reports of winds in excess of 60 mph. Severe thunderstorms even reached as far north as New England, where temperatures climbed into the 60s as a warm front passed through. 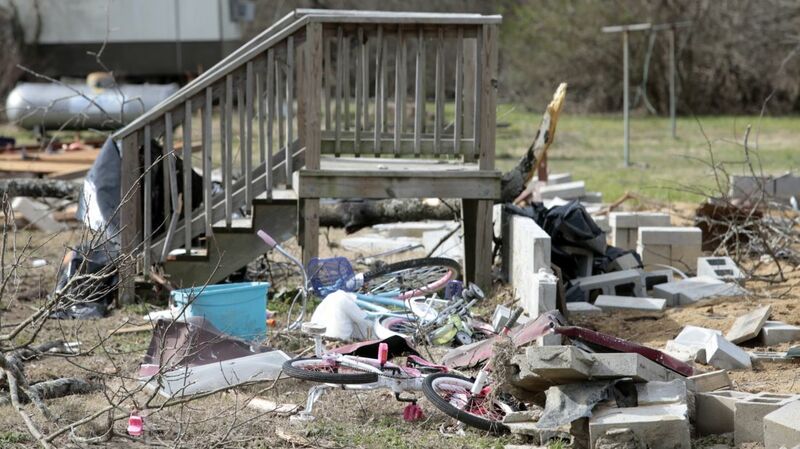 The storms killed at least seven people, with many more injuries as a result of the tornadoes and damaging winds. Some of the tornadoes were particularly strong, causing extensive damage to towns small and large. One of the tornadoes moved through Pensacola, Florida, on Tuesday, receiving an EF-3 rating on the Enhanced Fujita Scale after meteorologists used the damage there to estimate that winds gusted to at least 155 mph. Our active weather is the result of a substantial low-pressure system that formed in just the right spot to cause millions of headaches. The system began its life in Texas, growing into a formidable force that measured more than a thousand miles across and extended its reach from the Gulf of Mexico up through interior parts of Canada. Even though it’s winter, when you have a storm that large in our part of the world, it’s bound to cause issues no matter when it forms. The intensifying low-pressure system dragged warm, humid air north from typically tropical areas and provided the soupy, unstable air mass that thunderstorms need to fuel their ferocity. The high winds through the atmosphere also helped the thunderstorms develop and organize into the intense troublemakers they became. If you experienced this system, you know that the winds were just ripping on Tuesday and Wednesday. The stiff southerly breeze at the surface veered clockwise with height, blowing even stronger from the west tens of thousands of feet above the surface. This vertical twisting of the winds allows thunderstorms that develop to begin rotating, sometimes leading to tornadoes. Stronger instability and stronger wind shear can foster stronger tornadoes, and that’s what we saw this week. The storm is a reminder that we’re approaching the time of the year where violent thunderstorms will become more common than heavy snow and ice. A tornado outbreak during the winter isn’t common, but it’s also not unprecedented. We’re so used to hearing about “tornado season” that we forget that tornadoes are possible any time of the year—they’re just more common in certain spots during different seasons. The traditional tornado season runs from late March through late June, affecting what’s known as Dixie Alley (think Alabama and Mississippi) first in March and April, with the threat shifting to the central Plains (states like Oklahoma and Kansas) in May and June. Many of the recent tornadoes occurred along the northern Gulf Coast, which is about where you would expect them to happen in February. The majority of tornadoes we’ve seen during the second month of the year have touched down along and east of the Mississippi River. However, it was very unusual to see such an intense severe weather outbreak in the Mid-Atlantic. Virginia has only recorded about a dozen tornadoes in February between 1950 and 2014, none of which would be considered strong. The region saw numerous tornadoes during this outbreak, not to mention hundreds of reports of wind damage as far north as Maine, which is a feat that’s hard to accomplish even during springtime outbreaks. Despite the unusual nature of this early tornado outbreak, take some comfort in the knowledge that it’s probably not an omen of the year to come. Tornadoes require so many dynamic forces to come together just right that it’s hard to predict more than a week ahead of time whether or not they’ll form at all. Regardless of whether a season is quiet or active, every tornado is dangerous if it’s coming toward you. Always pay attention, and always have a plan.